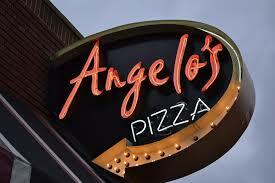 Angelos Pizza and Bistro is an upscale pizzeria and bistro serving up good old-fashion Italian food the bistro is decked out in the colors and flavor of Italy and the warm and professional staff will make you feel not only welcome, but truly valued. If Americans could choose to eat only one food for the remainder of their lives, it would have to be pizza. According to statistics from Franchise Disclosure Documents, Americans eat on average 100 acres of pizza daily or 350 slices per second.